Available on Stereopathetic Soulmanure and 2 other releases. "Rowboat" is perhaps Beck's best song from his early years. Everything about it is uncluttered and pure, from the lyrics to the arrangement to the performance. On Stereopathetic, the song is highlighted by the amazing Leo LeBlanc's pedal steel guitar. The song was spurred by the opportunity for Beck to record with Leo. As Beck remembered, "Actually Leo was a pedal steel player that I'd seen playing around Los Angeles -- this was about three years ago . I liked his playing so much and I always wanted to play with a pedal steel player, so I was recording some stuff and I called him up. I was so excited! He said, sure, he'd come down to the studio. So I was just about to go down to the studio when I realized I didn't have any songs to play with him, so I had to just throw ["Rowboat"] together." At its core, "Rowboat" is a crying-in-your-beer, heartbroken country song. The person he loves is gone and he's devastated. The terrific opening line "Rowboat, row me to the shore" is a calling from the depths of that devastation, longing for escape. He then explains his situation with some wonderfully simple and effective phrases. "She don't want to be my friend no more" is powerful in its basic simplicity, and gets repeated twice. I met this girl and she was moving out to LA [from New York] and I followed her along. We spent only a week in LA. I later followed her to Washington (state). We got this drive away pickup. I remember it took us a week to get to Washington. We ended up on this little island. We would sleep in this truck for awhile. . .My girl friend got this job working at a convalescent home. Then one day she just ran away back to New York. After that I ended up just kind of going back to LA. The last line of the first chorus ("you'll be far away") also leads directly into the next verse with its "she's a billion years away." 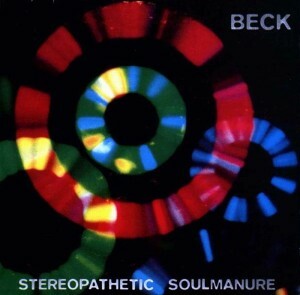 Beck continues describing the differences and distance between the two, while still feeling frustrated: "she is all and everything else is small." The next chorus has been altered slightly from the first. "Give me some alcohol" instead of "food to eat" works and plays of another of their differences (one asks for alcohol, the other is stoned). Dog food on the floor. And I've been like this before. Beck's been reading my mail. I do believe that the sum extent of the messiness, disarrangement, disorder and dirtiness of your room is equal to that of your brain. I'm not even going to ask Beck what the lines means, "I'll be home with the gasoline." Is it for her truck, or to burn her house? I know. In my head I know. I've been like that before. Rowboat, things are much better on the other shore. The early years, almost inexplicably, did not hear "Rowboat" on stage. Surely it must have been played a few times? I know of no bootlegs of it, however. The earliest version I know of came from Beck's set opening for Johnny Cash on January 7 1995, in Hollywood, CA. Leo LeBlanc joined him on stage, as he did on the record. On October 28 1995, Beck plays "Rowboat" for the first time in awhile. Apparently, it was a request, and from that night on, it was played a bit more frequently. "I heard somebody yell out for 'Rowboat.' I haven't played that in awhile. I'm gonna try that one. I'd like to send this one out to my friend, Leo LeBlanc, who I recorded it with. He's a pedal steel guitarist who passed away earlier this year, so I'm sending this one to you, Leo." Beck performs it alone on guitar and harmonica, as usual. It has a very somber tone to it, and later versions would be a bit perkier. The beautiful version on June 5 1996, is cut short by the recording. For some unknown reason, it fades out near the end of the second verse. Beck sings "dish rag on the floor," which is just as evocative as "dog food," if not as humorous. At this point, it's not a song Beck had really played too often on stage, but it's just making it's comeback. Finally, come the Odelay tour, Beck began to perform the song in full country rock band flavor on occasion. On July 21 1996, Beck kicks it off by saying "Give me some of that pedal steel!" Beck's band isn't quite as tight as when they blast through the "Novacane"s or "Devils Haircut"s, but that's what you want from "Rowboat." The loose feel is essential to its charm. Smokey Hormel plays a cool guitar solo, though Beck blows his harmonica over it. Beck changes the last two lines of the last chorus to "I'll be stranded on the other shore / Pack my bags and I'll head back home." A slow country trio version of the song (2 guitars, drums) shows up on September 1 1996. Most of the concert is Beck alone, in folk mode, but for a few songs, they were a country trio. Some pseudo-pedal steel guitar licks are added by Smokey as Beck really drawled his vocals. "We make no claims in being in control of what's going on," he explained. On the final show of the Odelay tour, on Sessions at West 54th on PBS, one of the finest versions of "Rowboat" was played. As Beck explains in the beginning, "This is a song I wrote about 4-5 years ago. Johnny Cash is doing it now. He's doing it a lot faster than me. He's doing it a lot deeper than me. But I haven't given up on it yet. It's called 'Rowboat.' It's kind of a country tune. 'Bout to go on vacation. . .step into the rowboat myself and stay there." The song began with a quiet acoustic guitar intro, and slowly other band members joined in throughout the song. "She is all and everything else is negligable" is the new line, and again Smokey plays a brilliant solo. "Has anybody got a hankie?" Beck asks when the song is over. They didn't do the song often on the Odelay tours, but there it did show up around 10-15 times. After touring for Odelay, "Rowboat" still got tossed out there every once in awhile. Touring for Mutations saw a few performances, while so did the Vultures tour. Most were probably as part of the acoustic set, though some of the band versions came during some now-famous gigs: Farm Aid, the two El Rey shows, the "secret" Largo show, the This Ain't No Picnic Festival. One I enjoy is from January 10 1999, where the song swung a little more than usual. Another awesome version is from the This Ain't No Picnic show, where Smokey Hormel re-joined the group for a night, and the "twin guitar assault" of Smokey and Lyle was especially enjoyable on "Rowboat." The song showed up sporadically on the Vultures tour, about 10 more times. Believe each one was as part of his acoustic set, or in the occasional acoustic-oriented concert. "Rowboat" continued to arise every once in awhile on his acoustic sets. 2002 saw an entirely solo acoustic tour, and Rowboat was only played 4 of the 20 shows. On the Flaming Lips tour, Beck would begin his set alone on stage before the Lips joined, and took to including "Rowboat" every so often. The song has NEVER been a regular in the setlist, but one Beck just always tosses in when he feels like. The song showed up twice in 2006, both full-on acoustic sets. "Rowboat" returned 3 times in 2013, still only at solo acoustic shows where the setlists vary. One more "Rowboat" was performed at a small solo club gig in London.